When launching a Chinese website, you can often forget a number of things in your eagerness to make it live. This blog reviews the most important and necessary checks that a typical Chinese website should be checked against before the official launch. This check list will be helpful for you to avoid unnecessary costs and some common mistakes, esp. when you do not have much knowledge about Chinese market and the internet situation. Where are your target market? You must be well aware where exactly your Chinese market is, Mainland China, HongKong & Macau, Taiwan, Singapore, South-East Asia, or Overseas Chinese communicties? You will face different localization standards based on the different countries/disctricts you chosen. 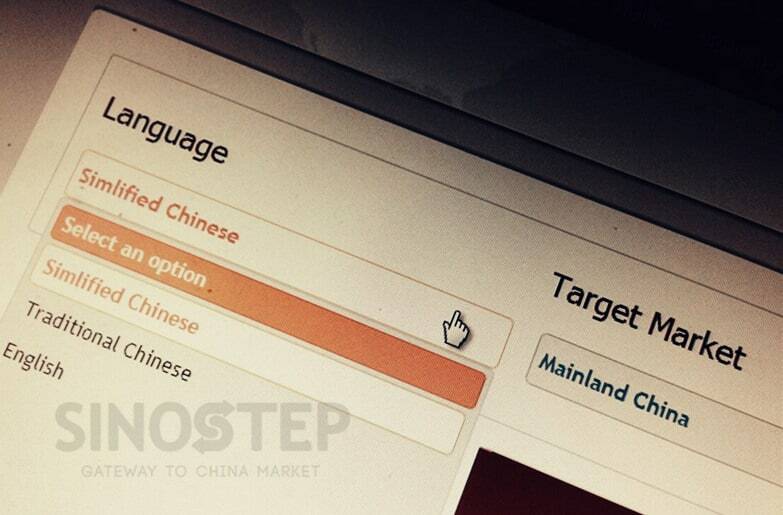 You should consider more than one “Chinese” versions for different target market. Basically Chinese is a group of several languages, some are very distinctive. You should be well aware the difference between them and use the right version for right markets. Make sure you have a localized Chinese keywords list and keep maintaining it. please notice the ‘dictionary translation’ of keywords is useless. Installing some sort of analytics tool is important for measuring statistics to see how your website performs and how successful your conversion rates are. Google Analytics is a good one, You can use some others as well, of course you can choose Some Chinese Analytics tool like Baidu Tongji too. Make use of Webmaster tool will help you analyze the critical problems of your website. It will save your a lot of time in website analysis. You can start Onsite SEO from the very beginning before the website launch. Please make sure which search engine is your focus, Baidu or Google. They have different algorithms and you can get better results if you can understand their differences. You should think twice whether you need a local China web hosting and balance the advantages and disadvantages. geo-targeting, but more about control. However, you should understand the requriements to have your site hosted in Mainland China too. It might be difficult for many companies organizations to get an ICP license in China. There are still ALTERNATIVE China Web Hosting choices for you to get your site fast, stable for web visitors in China. Do you think the domain is easy for your target Chinese users to remember? Do you want to use a Chinese .cn domain? Have you localized your branding messages? brand name, slogan, logo etc. There will be consistent efforts needed for the Chinese market. These are mainly design factors most site shall check, make sure the color and user interface are adapted to the Chinese culture. We can see a lot of differences between Chinese website and western ones. These can be considered part of branding. Make sure the themes of the images and videos are not offensive to the Chinese audience, we will cover this part more in the content check. Be sure to use the correct version. If you are not sure, do not use them. Why do you think your Chinese customers will think your know them if you are using British scales, different time zones and date formats? Sometimes the errors will be misleading or even ridiculous. Make sure they had been corrected before the official launch. Do you know which are the most popular payment gateways in China? How can your customers pay if you use the payment gateways they are not using? Make sure you follow the SEO skills with the Chinese search engine giant Baidu. We understand you normally will translated your existing web copies into Chinese. The best way is to use a professional Chinese translator to do the job and always remember the proofreading jobs. Sometimes you need to revise your original text and only leave those useful for your target Chinese markets. ChineseTrans (Easiest & Fastest way to get professional Chinese translation services) and Lingo365 Translation Services are two translation vendors who are strong in Professional Chinese Language services. Sometimes, you need to write specially for the Chinese markets, instead of translation only. Effective Chinese Copywriting will ensure you successfully implement your website localization strategy. You can make full use of good web copies in many sales tools to increase your ROI on a long-term. Due to the language struction differences between indo-european languages and Chinese, we will always find the language order is different in many cases. When translation is done without fully testing, you will see poor website expressions from time to time. Be sure that you have checked all the interfaces, dialogue boxes and so on. Make sure you use the proper expressions when referring countries/districts. Avoid publishing content that is frowned upon or banned within China is the basic requirements for your website. Limit or completely eliminate the use of externally pointing social functionality with Facebook, Google Plus, Twitter, etc. These sites had been blocked in China. If you are using their functionality, on the one hand, it will make your site difficult to use and the speed will be slowed down a lot, on the other hand, it will even put your website in danger of possible block. The correct way for you is to establish Chinese popular social media platforms. And an obvious reason is most of your target users are not using the facebook, youtube as you do, they are using different ones, Weibo, Wechat, QQ etc. Do not utilise major western platform functionality like Google Maps, Youtube Video, Facebook or Disqus, since they had been blocked, the use of them will make your site hard to use. Make sure there is no wrong code for Chinese users.